In passing..... although now used as a generic name for this type of craft, 'Hovercraft' was a trademark owned by Saunders-Roe, which is the reason for other manufacturers' use of alternative names to describe similar vehicles. The modern hovercraft is most often associated with Sir Christopher Cockerell, whose team was the first to develop the use of an annular ring for maintaining the cushion of air, the first to develop a successful skirt and the first to demonstrate a practical vehicle in extended use during the early Fifties. The British aircraft manufacturer Saunders-Roe developed the first practical hovercraft for people transport, the SR-N1 (Saunders-Roe Nautical 1) which was powered by expelled air from a single piston-driven engine and was only able to carry two people. It was first demonstrated on 11th June 1959 and made its first successful Channel crossing on 25th July of that year, but did not complete testing, including cross-channel work, until 1961 when Westland took over interest in the development. It was during this testing that the hovercraft's lift was partly improved by the addition of a 'double skirt' of flexible rubber around the lower surfaces to contain the air pressure. However, this solution caused problems of its own and Denys Bliss of Hovercraft Development Ltd. devised a solution for this by utilising a single sheet of rubber for the skirt, 'U'-shaped to provide both walls and with slots cut into the bottom of the U forming the annular vent. The first real hovercraft passenger service arrived in mid-1961 when the Vickers VA-3 started carrying passengers from Wallasey to Rhyl, a resort on the North Wales coast. This propeller-driven craft was powered by two turboprop aero engines. Saunders-Roe / Westland continued development through the Sixties, introducing larger, passenger-carrying machines. These included the SR-N2 which, in 1962, started operations across the Solent and later the SR-N6, which operated between Southsea and Ryde, IOW from 24th July 1965, carrying 38 passengers. The British Hovercraft Corporation (BHC) was formed in 1966 from a merger between Saunders-Roe and Vickers Supermarine. They developed and built the SR-N4 which was used by Hoverlloyd and Seaspeed (British Rail) when the cross-Channel ferry (30 cars and 254 passengers) service was introduced in August 1968. Seaspeed's 'Princess Margaret' initially operated between Dover and Boulogne but later on other craft were also used on the Ramsgate (Pegwell Bay) to Calais route. Cushioncraft Ltd was another British engineering company, formed in 1960 to develop and build hovercraft as a division of aircraft manufacturer Britten-Norman Ltd. Between 1960 and 1972 Cushioncraft designed 6 models of which 5 were produced. In 1971, Britten-Norman encountered financial problems and the Cushioncraft company was sold to the British Hovercraft Corporation in 1972. In the USA, Bell licenced and marketed the Saunders-Roe SR-N5 as the Bell SK-5. These were used by the US Navy, being deployed on trial in the Mekong Delta during the Vietnam War as PACV patrol craft. Hovermarine was formed in 1965 and displayed at Hovershow '66 with a sidewall hovercraft of 30 to 60 seat capacity together with a larger car carrying craft up to 300 tons. A licence for the use of HDL patented features was granted in early 1967 with the operational prototype being completed in January 1968. During late 1967 Hovermarine took over the Hovercat, a hovercraft developed by the Manx Hovercat company. The first HM-2 sidewall was operated in 1968 by Seaspeed, who operated it in the service between Ryde Pier Head and Portsmouth Harbour. BEA (British European Airways ) was formed by Act of Parliament in 1946 and operated the European and North African routes from many airports throughout the U.K. It was also Britain's largest domestic airline, operating internal flights to all major cities and, during the Fifties and Sixties, was usually the first to order the latest medium and short-haul aircraft from British manufacturers, such as the BAC 1-11, the Hawker-Siddeley Trident and the Vickers Viscount and Vanguard. The Viscount was a turbo-prop medium range aircraft, the first of it's kind to enter service, introduced by Vickers-Armstrong in 1953. The short-haul BAC 1-11 was actually designed by Hunting Aircraft but was manufactured by BAC (British Aircraft Corporation) after Hunting was merged with several other British aviation companies in 1960. The short and medium range Trident, DH121 and HS121, was of Fifties De Havilland design built by the Hawker-Siddeley Group in the 1960s subsequent to their merger with other companies. BEA continued under it's own banner until 1973 when it was merged with BOAC (British Overseas Airways Corporation) to form British Airways. BOAC BOAC came into being in 1939 as the result of previous mergers of smaller companies and, at the time, as a direct result of the merger between Imperial Airways Ltd and British Airways Ltd.
Imperial Airways was formed in 1924 as a result of several mergers involving Aircraft Travel and Transport Ltd., Handley Page Transport Ltd., Instone Air Line Ltd., Daimler Airway, and British Marine Air Navigation Co. Ltd., and operated flying boats from Southampton to British colonies in Africa, Asia and Australia from the Thirties until November 1950 using aircraft such as the Short Empire and Short Calcutta 'flying boats' to carry both passengers and mail. The Short S.23 'Empire' and S.8 'Calcutta' were manufactured by Short Brothers of Northern Ireland. British Airways Ltd. came about in 1935 as a result of several mergers (Spartan Air Lines Ltd., United Airways Ltd. and British Continental Airways Ltd.) and was first formed as Allied British Airways in October 1935, operating in Europe. On acquiring Hillman's Airways Ltd. it changed it's name to British Airways Ltd., adopting a winged lion as it's emblem and transferring it's headquarters to the newly-built Gatwick Airport. It started life with a strange mixture of aircraft including the Junkers Ju52 and the DeHavilland 'Express' but fierce European competition soon resulted in acquisition of more modern craft such as the Dutch-made Fokker F8 and F12 as it expanded it's operation across the European capitals and major cities. On moving into Eastern European markets in Hungary and Poland it acquired the American-built Lockheed Electra L-10. The two companies were not direct competitors, British Airways Ltd being a private company concentrating on Europe and the more romantic Imperial Airways, with it's state subsidy, servicing the more far-flung outposts of the British Empire, but were merged shortly after the outbreak of World War II to form a single state-owned carrier - BOAC - The British Overseas Airways Corporation (BOAC). BEA (British European Airways) - European and domestic and BSAA (British South America Airways) - South America and Caribbean routes. BSAA was originally named British Latin American Air Lines (BLAIR) and was split from BOAC to operate their South Atlantic routes. It began transatlantic services in March 1946 from London Heathrow Airport. It operated mainly 'Avro' aircraft, the 'York', 'Lancastrian' and 'Tudor', and flew to Bermuda, the West Indies and the West coast of South America. The company was plagued by strange incidents, including the unexplained losses of the Tudors 'Star Tiger' and 'Star Ariel' which were attributed to the mysterious Bermuda Triangle and the 'Stendec Incident' involving the loss of the Lancastrian 'Stardust' in the Andes after sending only a partly readable radio message. The discovery of the wreckage of Stardust in 2000 subsequently indicated an unremarkable accident. BSAA was in the process of planning to introduce De Havilland Comets in 1949 when it was merged back into BOAC. In May 1952 BOAC became the first airline to use a passenger jet, the De Havilland Comet, flying to Johannesburg in 23 hours with five stops. After three of the Comets were involved in crashes during a short period investigators discovered serious cracks in the structure of the planes and all Comet I aircraft were grounded in April 1954. De Havilland subsequently designed an improved Comet, the Series 4, which avoided the problems of pressurisation stresses. In 1956 BOAC had ordered 15 American Boeing 707s, thus beginning a relationship which would make British Airways the biggest Boeing customer outside of North America. The next major order was for 11 Boeing 747-100s. A significant domestic order was placed for 12 Vickers VC-10s in 1957. The specification of these was written for BOAC's specific requirements. BOAC also acquired 17 stretched Super VC-10s With the Comet 4, BOAC became the first airline to fly transatlantic passenger jet services to New York, in October 1958, just days ahead of their American rivals. The company took possession of it's first Boeing 747 on April 22nd 1970, but this did not enter commercial service until April 14th 1971 due to industrial action by the British Air Line Pilots Association. The British Airways Board was formed on September 1st 1972 as a holding board that controlled both BOAC and BEA. On March 31st 1974 BOAC and BEA were dissolved and merged with two smaller operators, Cambrian Airways and Northeast Airlines, to form British Airways. Interestingly, if not for this merger, BOAC would have been one of the first operators of the Concorde, and one of BA's original Concordes actually carried the registration G-BOAC. Autair / Court Line was a UK holiday charter airline in the late 1960s and early 1970s. In conjunction with Clarksons Holidays it pioneered cheap package tours to Spain and other sunny places, opening up a whole new opportunity to the British holidaymaker. Originally named Argus Air Transport when it started in 1957, it became Autair (Luton) in 1960 and Autair International Airways in 1963 before it was bought by Court Line in 1965.It retained the name Autair until it became subject to a complete 'makeover' in 1970 and was relaunched as Court Line Aviation with it's BAC 1-11s painted a variety of unusual pastel colours. Aircrew wore trendy Mary Quant-designed uniforms and the whole experience was geared up to make passengers' often first flying experience a fun one. The company went into liquidation in 1974. A new charter airline, operating out of Luton Airport, was formed in 1962 and called Euravia. At the end of 1964 Euravia changed its name to Britannia Airways. In 2004 it was rebranded Thomsonfly as part of the TUI Group and then Thomson Airways. It is now, one of the world's largest charter airlines and is still based at the airport. Monarch Airlines was formed on 5th June 1967 with financial backing from the Swiss Mantegazza family, as a subsidiary of Globus Getaway Holdings. At the time of Monarch's inception, the Mantegazza family were the owners of UK-based tour operator Cosmos Tours (now Cosmos Holidays). Monarch began commercial airline operations on 5th April 1968 with a charter flight from London Luton to Madrid using a former Caledonian Airways Bristol 175 Britannia 300 turboprop. The airline's initial fleet comprised two Bristol Britannias, both ex-Caledonian. The airline acquired additional Britannias from the administrators of British Eagle in 1969, its second year of operation. This was the first time the company carried 250,000 passengers within a 12-month period utilising a fleet of six Britannias. Monarch entered the jet age in 1971 when three Boeing 720Bs joined its fleet. Freddie Laker unveiled his airline to the press in February 1966, commencing commercial operations from Gatwick Airport on 29th July with two former BOAC Bristol Britannia 102 turboprops, initially operating under contract to Air France. The aircraft's livery was a combination of black, red and white, an adaptation of Laker's racing colours. The Britannias were eventually replaced by five BAC One-Eleven 300 short-haul jet aircraft from December 1967. Laker Airways pioneered cost-saving to reduce its engines' wear and tear, reduce fuel consumption and achieve greater range than indicated by the manufacturers' range specifications. 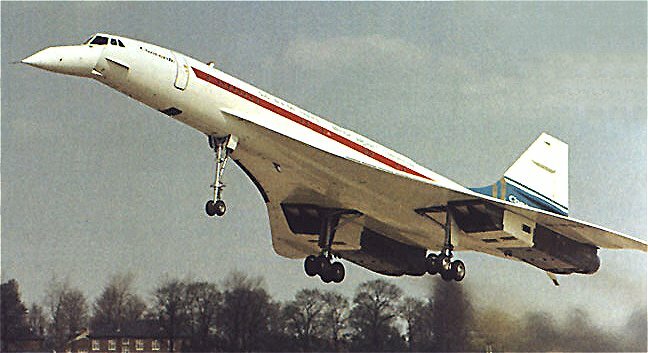 It was the first to use the reduced thrust take-off technique it had developed for the BAC One-Eleven. Among other weight-saving measures Laker Airways used was a baggage allowance limit of 15 kg rather than the more usual 20 kg as well as carrying fewer passengers than the aircraft could hold. The early 1970s saw the airline and its owner battle with aviation authorities in the UK and US to gain approval for a low-cost transatlantic service. This was to be marketed as 'Skytrain'. On 1st April 1973, new charter regulations were introduced with simplified rules termed 'Advance Booking Charters', popularly known as ABC. The following day, Laker Airways flew the world's inaugural ABC flight from Manchester to Toronto, with passengers paying £45 return. Laker's transatlantic charters provided meals, movies (new in those days) and a free bar. A complicated system of licenses and agreements limited Laker's ability to gain sufficient air routes and access to airport facilities and the airline ultimately did not have the financial strength to survive the early 1980s recession and competition by the established scheduled airlines. Laker Airways collapsed during the early morning of 5th February 1982 with debts of £270m, the biggest corporate failure in Britain. Sir Freddie sued British Airways, British Caledonian, Pan Am, TWA, Lufthansa, Air France, Swissair, KLM, SAS, Sabena, Alitalia and UTA for conspiracy to put his airline out of business by predatory pricing, settling out of court for $50m, which let Laker Airways pay its debts. British Airways reached a separate out-of-court agreement with Sir Freddie personally for £8m. British Eagle International Airlines was a major British independent airline that operated from 1948 until it went into liquidation in 1968. It was founded as Eagle Aviation at Aldermaston in 1948 with two converted Handley Page Halifax bombers used for cargo operations. The same year, the new airline joined the Berlin Airlift. Eagle aviation moved to Luton in 1950 and began carrying troops under contract to the government in 1951. Operations moved to Blackbushe Airport in 1952, followed a year later by the launch of scheduled services in association with BEA, from whom Eagle had purchased a large fleet of Vickers Vikings. Package holidays to Italy and Spain were offered from 1954, in association with tour operator Sir Henry Lunn Ltd. Between 1955 and 1960, many of the airline's aircraft carried the Eagle Airways operating name. Operations moved to Heathrow in 1960 as a result of Blackbushe's closure to commercial traffic. Cunard acquired a controlling stake in Eagle in March 1960 which resulted in the creation of Cunard Eagle. In June 1961 the airline became the first British independent to be licensed as a scheduled carrier between Heathrow and JFK in New York, but a subsequent appeal to the Aviation Minister by BOAC against this decision resulted in revocation of Cunard Eagle's transatlantic licence in November. Pure jet operations began on 27th March 1962, the first by a British independent airline. In June 1962 BOAC-Cunard, a new £30 million company jointly owned by Cunard Line and BOAC, absorbed Cunard Eagle's new jet fleet and scheduled long-haul routes, resulting in cessation of the independent's jet operations. Harold Bamberg's disenchantment with Cunard led to his resignation from the BOAC-Cunard board in 1963, followed by a decision to regain control of Eagle by buying back Cunard's majority shareholding in the airline. This led to reconstitution of the company as British Eagle International Airlines the same year. [ Following the airline's relaunch, scheduled services commenced between Heathrow and Glasgow Renfrew in November 1963. This was the first time a British independent airline was permitted to compete with BEA on a domestic trunk route. British Eagle expanded its UK domestic scheduled network further by taking over Starways and its Liverpool routes on 31st December 1963. Poor load factors and arbitrary frequency restrictions resulted in British Eagle's temporary suspension of all domestic scheduled flights in February 1965. Limited resumption of UK domestic scheduled services on Heathrow-Glasgow in July 1965 was followed by the relaunch of commercial jet operations between Heathrow and Glasgow on 9th May 1966. Successful completion of the repurchase of Cunard's shareholding at the beginning of 1967 left Harold Bamberg in sole charge of British Eagle. An unsuccessful bid for transatlantic scheduled traffic rights in 1967-68 was followed by the airline's resumption of long-haul jet operations to the Caribbean on a charter basis in February 1968 but complaints from BOAC led to the revocation of British Eagle's Caribbean charter licence at the end of the 1968 summer season. Financial and business factors combined to undermine the airline's trading position and confidence in its future and the subsequent withdrawal of support by its main backer forced it to cease operations on 6th November 1968, followed by voluntary liquidation two days later. In September 1931 Heston Air Park was renamed Heston Airport with the provision of customs facilities and improved passenger handling capabilities. Night flying facilities were installed and, in 1932, it was designated as an official commercial diversionary airport, frequently used when Croydon Airport was fog-bound. It is believed that the main building was the first purpose-built control facility, on which all modern airport control towers are based. In 1930 Fairey Aviation bought around 150 acres of ground near Heathrow and constructed the Great West Aerodrome as a private airport for the assembly and testing of its aircraft, becoming operational in June of that year. In 1943 The Air Ministry, headed by the Secretary of State for Air, Sir Archibald Sinclair, secretly formulated plans to requisition the airfield under the Defence of the Realm Act 1914, allegedly to address the needs of long-range bombers, but were actually based on recommendations from professor Patrick Abercrombie for a new international airport for London. The project was headed by the Under-Secretary of State for Air, Lord Balfour, who kept the true reason for acquisition hidden from Parliament. The plan was enacted in April 1944 despite significant opposition from Fairey. Fairey moved its operations to Heston Aerodrome, and stayed there until 1947, when they relocated again to White Waltham airfield in Buckinghamshire, over 20 miles from their manufacturing facility. Fairey fought for compensation until 1964 and, during this time, their hangar at Heathrow could not be demolished - it was later used as Heathrow's fire station. The new airfield was still under construction at the end of the war. An RAF-style control tower was built along with 2 runways in a 'V' formation. No RAF aircraft were based there, although all the base facilities had been built. Ownership was officially transferred to the Air Ministry for use as London's new civil airport on 1st January 1946. On 10th January The British Cabinet agreed Stage 3 of the airport, an extension north of the Bath Road, with a large triangle of three runways, and the opening ceremony was performed on 25th March 1946 by Lord Winster, the Minister of Aviation. The first aircraft to use the new airport was a British South American Airways (BSAA) converted Avro Lancaster bomber named 'Starlight' for a flight to Australia via Buenos Aires. "Clipper Seven Seas" arriving at London (Heathrow) 12th September 1954 The first aircraft owned by a foreign airline (a Panair Lockheed 049 Constellation) landed on 16th April 1946 after a flight from Rio de Janeiro. The newly-titled 'London Airport' was officially opened for commercial civilian operations on 31st May 1946. By 1947 Heathrow's three runways formed a triangle consisting of 100/280 (9,200 ft), 156/336 (6,300 ft), and 52/232 (6,700 ft). 156/336 was soon to be replaced by another parallel runway situated further west that allowed for planned expansion of the terminal area inside the triangle with the temporary passenger and cargo buildings being situated at the north-east end of the airport, just south of Bath Road. These consisted of Army marquees, caravans and prefabricated RAF huts which were basic but comfortable, fitted out with floral-patterned suites and tables with vases of fresh flowers. Passengers had to walk to aircraft on wooden duckboards to protect them from the muddy airfield. There was no provision for heating and could be bitterly cold in the winter, but in summer the marquee walls could be removed to allow a cooling breeze to blow through. By the end of its first year of operation it had handled 63,000 passengers. This had increased to 796,000 by 1951, at which time the British architect Frederick Gibberd was brought in to design permanent buildings. A central area was planned, to be accessed via a road tunnel running underneath the original 28R/10L main runway, with a control tower, a passenger terminal and an administration block. In 1953 passenger figures reached 1million and flights totalled 67,000. During the year Queen Elizabeth II ceremonially laid the first slab of a new runway and, by the mid-1950s three more runways had been completed, forming the familiar 'Star of David' hexagram pattern, ensuring that two of the runways would always be within 30° of the wind direction. Queen Elizabeth II opened the first permanent passenger terminal, Building 1 (the Europa Building later re-designated as Terminal 2), in 1955 and on 1st April 1955 the new 127 ft control tower designed by Frederick Gibberd opened, replacing the original tower built in the 1940s. The second central terminal building, Building 2, was completed in 1956. Linked to Building 1, this was named the Britannic Building. By 1960 the number of passengers flying in British airspace was measured at 10,075,000 with 5.27 million of them using Heathrow. In 1965 Labour minister Roy Jenkins introduced the Airports Authority Bill, intended to make the nation's airports more flexible and able to generate revenue while remaining responsible to Parliament. The British Airports Authority was established and assumed responsibility for Heathrow, Gatwick, Stansted and Prestwick airports in 1966 (also acquiring Edinburgh, Aberdeen and Glasgow airports in 1971). Heathrow's Oceanic Terminal (renamed Terminal 3 in 1968) opened on 13th November 1961 for long-haul flights. During the late 1960s the Heathrow Cargo Terminal was constructed to the south of the southern runway, being connected to Terminals 2 and 3 (and eventually Terminal 1) by the Heathrow Cargo Tunnel. Terminal 1 was a long time coming but was officially opened by the Queen in May 1969, at which time passenger numbers had risen to over 24 million passengers a year and the airport was 'home' to 14 different airline companies. This coincided with the beginning of a £30million investment programme for the extension of Terminal 3 and the lengthening of runways from 9,000ft to 12,000ft in order to be able to accommodate the Boeing 747 Jumbo Jet. Car parking facilities were also to be expanded and provision made for the bus and underground stations that were to follow. The airport cost £7.8 million to build and was officially opened by HM The Queen on 9th June 1958. Originally, Gatwick had only one passenger terminal, the South Terminal, and in 1962 this was doubled in size with the construction of two new piers. The 'new' Gatwick was the world's first single facility airport accessible by all modes of transport - air, rail and road. In 1965, the British Airports Authority was established and assumed ownership of Heathrow, Gatwick, Stansted and Prestwick airports. The original runway was built in 1942 by the USAAF and it flew off more than 600 aircraft to support the D-Day operation in 1944 During the package holiday explosion in the 60s, Stansted became known as London's third major airport, but its future became uncertain shortly after this, as the huge number of complaints and protestations about the possible development of the airport led to plans for its growth being scrapped by the government. Following the world oil crisis, when other airport options became too expensive, the increasing demand amongst the holidaymaking British public led to a turnaround in government policy and the development plan was approved. This growth led to it being bought out by the British Airports Authority in 1966. BAA developed the terminal in 1969 and extended it in 1972. In 1984 Stansted airport gained approval for further expansion to accommodate increasing passenger numbers, and in 1986 work began on the award-winning main terminal design that stands today, being completed in 1991. Luton Airport was officially opened on 16th July 1938 as 'Luton Municipal Airport' by the Right Honourable Kingsley Wood, Secretary of State for Air. The airport was owned by the Borough of Luton and it was considered that Luton ought to be designated the northern terminal for London. During the war the airport continued to operate as a commercial aerodrome as well as being the base for 264 Fighter Squadron. It was also a manufacturing site at which the Percival Aircraft Company designed and built a series of aircraft for both civil and military use - including the Mosquito fighter bomber, built under licence from the De Havilland Aircraft Company. Development of the civil use of the airport continued after the war. A new control tower was opened in 1952, but growth was slow until Customs facilities were obtained in 1962 and package holidays abroad became popular. The grass runways were inadequate for modern traffic and a 5,000-foot concrete runway was built in 1960, later extended. The 1950's and 1960's saw the birth of affordable holidays which combined the transport and accommodation arrangements into a single 'package', enabling many people to travel abroad for the first time, and laid the foundations of the 'inclusive tour' holiday market. Passenger numbers rose from 5,000 in 1960 to 213,000 in 1965 and a 1969 a survey showed that a fifth of all holiday flights from the UK departed from Luton which, by 1972, had become Britain's most profitable airport. GWR (Great Western Railway), LMS (London, Midland and Scottish Railway), LNER (London and North Eastern Railway) and SR (Southern Railway). The London Underground and the Glasgow Subway systems remained as independent operators as did a small number of industrial and light railways and local tramways, but these did not constitute a significant mileage compared to the system as a whole. The railways were put under government control during the second World War, during which time they suffered heavy bombing damage and general neglect due to the war effort. The Transport Act of 1947 led to the nationalisation of the network as part of a policy by Clement Attlee's Labour Government to nationalis all public services. As a result of this, British Railways came into being on 1st January 1948 with the merger of the four regions under the overall control of the Railway Executive of the British Transport Commission. Concentrating on the UK mainland, services owned by LMS in Northern Ireland were sold off to the Stormont Government in 1949 to be controlled by the Ulster Transport Authority. The new system was subdivided into six geographical regions instead of the previous four and this remained the basic operational structure of British Railways until the Eighties, with an element of independence but also a fair degree of centralisation: ER (Eastern Region), LNER (Southern LNER lines), NER (North Eastern Region - northern LNER lines in England), LMR (London Midland Region - LMS lines in England and Wales), Scottish Region (LMS and LNER lines in Scotland), SR (Southern Region - SR lines), WR (Western Region - GWR lines). The British Transport Commission's 1955 Modernisation Plan recommended the outlay of £1,240 million over a period of 15 years for bringing the network up to date. Included in this were plans to make the rail service more attractive to passengers and freight operators who had, for a long period, been increasingly turning to road transport. The three main proposals were electrification of main line routes, wide-scale introduction of diesel and electric engines and the replacement of old coaching stock along with a major investment in renewal and upgrading of signalling systems and railway track. British Rail built 2537 steam locomotives during the period 1948 to 1960, 1538 were constructed to pre-nationalisation designs and 999 to their own standard designs. The steam locomotives had comparatively short working lives, some lasting as little as five years, mainly because of the decision to end the use of steam power by 1968, against a potential design life of over 30 years and a somewhat hopeful theoretical final withdrawal date in the 1990s. In 1960, the BR 9F 2-10-0 'Evening Star' class were some of the last steam locomotives to be produced before it was decided to move ahead with the phasing-out of steam power in preference to diesel-electrics. Diesel and electric trains were experimented with, and used, by British rail considerably prior to the Sixties. The steam 'replacements' were more aerodynamic and fairly futuristic in appearance, well suited to the 'space' decade. One of the most famous of these was the English Electric 'Deltic' (BR Class 55) which was one of the first diesel locomotives designed and manufactured for use on British main lines. The prototype underwent trials at Liverpool in 1955, eventually going into production in 1961 and 1962. A total of only twenty were built, featuring two English Electric Napier Deltic 18-cylinder two-stroke 1650hp diesel engines..... using a cylinder configuration that was originally created for motor torpedo boats! The 'Deltic' engines were used in two types of British rail locomotive: classes 55 and 23, built in the 1960s. Because of their engines, these types were named 'Deltics' and 'Baby Deltics'. The Class 55 used two D18-25 series II type V Deltic engines which were mechanically-blown 18-cylinder engines each rated at 1,650 hp (1,230 kW) continuous at 1500rpm. The Class 23 used a single, less powerful, nine-cylinder turbocharged T9-29 Deltic of 1,100 hp (820 kW). While reasonably successful, and powerful for its size and weight, it was a sensitive unit that required careful maintenance leading to a policy of unit replacement rather than repair, which is probably the reason for the small number built. Deltics were withdrawn from the end of the 1970s, the last serving in 1981.... or did it?. Six locomotives were preserved and are still running today. Diesel electrics abounded in many classes, but the movement was definitely towards fully electric locomotives. Despite this. the various 'Deltics' carried on and it was not until the late 1970s that the Deltics really began to be supplanted by the 'next generation', the Class 43 High Speed Train (HST), branded as InterCity 125. A 1956 White Paper proclaimed that this modernisation would assist in eliminate BR's cash deficit by 1962. However, it failed to take into account the growth of mass road transport and the effect on the traditional role of the railways. This resulted in vast amounts of money being wastefully invested in things like marshalling yards when small wagon-load operations were in fast decline. British Railways were also fettered by archaic freight charge regulations which forced them to transport unprofitable freight. This severely affected any possibility that the railways could compete with road transport and made profitability an impossible dream. In the face of huge losses, the plan was reconfigured in 1959 to speed up rationalisation and modernisation. This resulted in huge orders for new diesel engines, then only under development and which were to prove unsuitable at a later date. In 1962 the British Railways Board was created to supersede the British Transport Commission which was also responsible for road transport and the canal systems, in addition to the railway network. 1963 saw the publishing of the 'Reshaping of British Railways' by BR chairman Dr. Richard Beeching. In a bid for rationalisation, many unprofitable rural lines were closed, the Beeching 'axe' also falling on most branch lines and even some main lines. This period also witnessed the "Great Locomotive Cull", with mass replacements of steam engines with diesels, and of course far fewer were needed on the pared-down rail system. The bell finally tolled for the days of steam on the networks in the North-West of England during August 1968. Regardless of this, the industrial use of steam locomotives on independent lines, most notably those run by the National Coal Board, continued well into the 1970s. Although a small number of steam locomotives were preserved, most fell victim to the scrapyards. Between 1958 and 1974 the West Coast main line was gradually subjected to overhead line electrification to the French standard AC voltage of 25kV 50Hz. Many passenger lines in the London and Glasgow areas were also electrified and Southern Region pushed it's 750V DC 3rd rail system out to the Kent coast. Despite all this electrification, it never achieved the system-wide efficiency that European railways were enjoying. On the 'death' of steam in 1968 the operation was relaunched under the name 'British Rail' and it was at this time that the double-arrow logo, still used to represent the industry, was introduced along with the standardised typeface used for communications and signs and the "rail blue" livery which was applied to nearly all locomotives and rolling stock. The logo was somewhat unfortunate as it prompted some cynics to suggest that it meant the railway "didn't know if it was coming or going"). During the 1960s the TOPS system for classifying locomotives and multiple units was introduced. Hauled rolling stock continued to carry a separate series of numbers. Also during this period the bright yellow 'noses' - yellow warning panels - were added to the front of diesel and electric locomotives and multiple units in an attempt to increase the safety of track and line workers. In 1970 the major engineering works were hived off into a separate company - British Rail Engineering Limited. In 1960, the two major British lines trading with the far east, the Orient Steam Navigation Company and P&O, agreed a merger at a time when each had it's largest liner to date already under construction, the 'Oriana' and the 'Canberra'. Built by Harland and Wolff in Belfast, these were the largest ships to be built in the UK in 20 years. Both had unusual features: The 'Canberra' had twin funnels located side-by-side towards the aft of the ship and her lifeboats were slung low in the hull, with several decks above them. Now very commonplace, this was revolutionary at the time. Canberra usually sailed between Southampton and Australia with occasional world cruises. At 44,800 GRT, she could carry 2,100 passengers in two classes or 1,737 on a single class cruise. By 1973 the air travel industry was booming and P&O began removing older ships from it's fleet. The Canberra was briefly diverted to Caribbean cruises in an unsuccessful partnership with Cunard before returning to resume cruises from Southampton. Like the QE2, Canberra saw action in the Falkland War and was finally withdrawn and scrapped in 1997. Of even stranger design was the Oriana, with two funnels of completely different design - the forward one being nearly two storeys higher than the aft. Her bridge was nearly amidship and crowned a series of terraced decks and a long bow. At 41,915 GRT and 804 feet long, she was built in Barrow-in-Furness by shipmakers Vickers-Armstrong, joining Canberra on the Australia run in 1960 until 1986. She has since been used as a floating hotel in Japan and, more recently, Dalian, China. She capsized in a storm in 2003 but managed to be righted. P&O merged with the British India Company in 1914 and by 1932 had a fleet of 41 ships, including 21 passenger liners. The government requisitioned the entire P&O fleet for war service in 1939, only 13 of which survived. These remaining vessels were ageing badly by 1960 when P&O merged with Orient and the two new liners became the mainstay of their fleet. During the Seventies P&O purchased Princess Cruises (of TV 'Love Boat' fame) which was later to merge the Italian cruise line SITMAR. Princess is now promoted as a separate operation, mainly to the American market, while their "classic" liner fleet is targeted extensively at the British market. Acquired by Cunard in 1948, the 'Caronia' was one of their first ships to be specifically designed for cruising. From the outset, she was very popular and remained profitable for nearly all of her eighteen year service. For a time she was painted in four different shades of pale green (excluding her traditional red-and-black funnel), and was familiarly known as the "Green Goddess". On becoming unprofitable to operate, she parted ways with Cunard in 1967. Following a series of name changes and ill-fated operations she ran aground and broke up at Guam in the summer of 1974 on her way to a breakers yard in Taiwan. The four sister ships Carinthia, Ivernia, Saxonia and Franconia were each 608 feet long and drew 21,947 GRT and were built for Cunard's Canadian service in the Fifties. By 1962, the only one of the four remaining on that route was the Carinthia. The Carinthia and another ship, Sylvania, were sold to the Italian cruise line SITMAR in 1968. 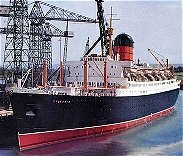 They were extensively modernised and renamed - Carinthia becoming Fairland (later Fairsea) and Sylvania acquiring the more elegant Fairwind. 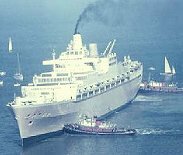 Fairsea also experienced another major refit in 1984 before the ships returned to British ownership when SITMAR was bought by P&O in 1988. Naturally, there were more name changes, Sylvania/Fairwind becoming Dawn Princess and Carinthia/Fairland/Fairsea becoming Fair Princess. Dawn Princess was later sold yet again, to a German line, and is now named Albatros. Fair Princess replaced Fairstar in the Australian budget cruise business before being sold on to an Asian company and is now known as China Sea Discoverer. The Ivernia and Saxonia were renamed in the 1960s, becoming the Franconia and Carmania respectively, and treated to the same green paintwork as the Caronia. The two ships continued to cruise for Cunard until 1972 when they were sold off to Russian interests. The Franconia was renamed Fedor Shalyapin and the the Carmania became known as the Leonid Sobinov, the latter being broken up in India in 1999. Bigger than Queen Mary, her older 'sister' ship, Queen Elizabeth (I) was built by John Brown & Co. at Clydebank, Scotland, during which time she was known as 'Hull 552', and officially launched on 27th September 1938, construction, fitting-out and trials being completed in 1940. At 1,029 feet long, 118ft wide and 83,673 GRT she looked similar to the Queen Mary but was constructed with two stacks instead of three. She had the distinction of being the largest ever riveted ship measured by gross tonnage. Queen Elizabeth performed the official launching ceremony on 27th September 1938. Being World War II, Queen Elizabeth was immediately commandeered as a troop carrier, going straight from the shipyard to America. Both Queen Elizabeth and Queen Mary were used as troop transports during the war as their high speeds allowed them to outrun German U-boats, allowing them to travel without a convoy. She finally achieved her destiny when she began transatlantic passenger crossings six years later, in October 1946, with three classes of accommodation catering for 2,288 passengers. She and the Queen Mary carried out the transatlantic run in tandem for the next 20 years when, for a brief period in the Sixties, Cunard tried using them for winter cruises due to lack of passengers. By this time, transatlantic flight was becoming faster and more popular, reducing the market for the big ships. It was decided that the Queens were also too big for cruising and they were finally withdrawn from service in 1968. Queen Mary was retired from service on 9th December 1967 and was sold to the city of Long Beach, California. Queen Elizabeth was sold to a succession of buyers, finally being sold to a Hong Kong businessmen in 1970, Tung Chao Yung, who intended to convert her into the Seawise University. She was to be converted and used on worldwide cruises carrying students and others but, in 1972, just before completion, she mysteriously caught fire and sank in Hong Kong harbour, where she was deemed an obstruction and was later broken up where she lay. The Mersey Ferry is a service operating on the River Mersey between Liverpool and the Wirral Peninsula. Ferries have been operational since at least the 12th century. The recent fleet consisted of three vessels, all originally operational in the 1960s and named Mountwood, Woodchurch and Overchurch. All three were extensively refurbished and renamed 'Royal Iris of the Mersey', 'Snowdrop' and 'Royal Daffodil' respectively. The most famous of these is probably 'Royal Iris' which was built in 1950 by Denny's Shipbuilders of Dumbarton for Wallasey Corporation at a cost of £400,000, entering service in 1951. Fish and chips were available on board, hence the boat's nickname 'The Floating Fish and Chip Shop'. She was the first diesel-powered ferry vessel and had four diesel generators connected to two Metrovick marine propulsion units. She was different to the other ferry vessels in that she had smooth lines and a false funnel. In the Sixties she played host to bands such as Gerry & The Pacemakers, The Searchers and The Beatles, famously being featured in the pop film 'Ferry Cross The Mersey'. It is possible that Billy Fury may have worked on her as he was a ferry worker before he gained fame as a pop singer. On receiving a major refit in the 1970s, her fish and chip cafe was removed and replaced with a steak bar. She remained in service for nearly 40 years before being sold in 1993, two years after she was withdrawn from service, for use as a floating nightcluband is now berthed at Woolwich, London. A ferry service had been in operation across the river Thames at Woolwich since around the fourteenth century and the crossing became more important following the establishment of the Royal Arsenal. The army initiated its own ferry in 1810 to facilitate personnel and supply movement. An Act of Parliament in 1811 established a commercial ferry company which was dissolved in 1844. In 1846, the Eastern Counties and Thames Junction Railway extended its track to include a Thames wharf branch line and this resulted in three steam ferries eventually operating, but were still unable to cope with the increasing demand. Although a public meeting was held in Woolwich in October 1880 to discuss the issue, the costs involved seemed too great. Following the establishment of the Metropolitan Board of Works, it was suggested that they should provide funding for a Thames crossing and it was agreed that they would provide a free ferry service. As a result, Messrs Mowlem and Company were awarded contracts to build the approaches, bridges and pontoons in September 1887 with the service officially opening on 23rd March 1889. Only two days prior to this the Metropolitan Board of Works was replaced by The London County Council (LCC) who continued to operate the ferry until it was, itself, replaced by the Greater London Council (GLC) on 31st March 1965. The three ferries in use today were built in 1963 and the current terminals were opened in 1965. There was a regular ferry service across the Forth between Edinburgh and Fife that continued to grow until the construction of the Forth Railway Bridge was completed in 1890. The rise in private car usage made the car ferries across the Forth the busiest route in Scotland and, in the 1950s, there were four regular ferries making 40,000 crossings annually. The service ended when the Forth Road Bridge was opened on 4th September 1964. Another important ferry service was the Tay crossing between Fife and Dundee. The service, and the unique pier buildings used to collect fares, ceased to be used in 1966 when the Tay Road Bridge opened. Although there have been transport connections between the Scottish mainland and its islands for as long as they have been populated, the history of Caledonian MacBrayne goes back to 1851, and Government interest in ferry services in Scotland goes back to the start of the Sixties. The first major event in the development of Government support for ferry services was the Highlands and Islands Shipping Services Act 1960 which provided the first comprehensive legal framework for subsidy arrangements and enabled the Secretary of State for Scotland to seek Parliamentary approval for 'undertakings' to support ferry transport services in the Highlands and Islands. The first such was made in 1961 to fund what became Caledonian MacBrayne Ltd to provide Clyde and Hebrides ferry services. The 1960 Act also provided the legal basis for Government support for maritime transport services to Orkney and Shetland. Similarly, information about British military vehicles (essentially army vehicles) can be found at War History Online.